More than 50 percent of the nearly 7,700 registered voters in Clinton County took advantage of the sunny skies and fair temperatures Tuesday for general election day, to cast votes that would decide who was leading our government agencies for the next term. When those new office holders are sworn in this coming January, Ricky Craig will be the new Clinton County Judge/Executive, Lyle Pierce will take his seat in the Albany Mayor’s office, and Nathan Collins will be the new Clinton County Clerk. In addition, residents in the School Board District Five will have a new school board member in Bobby Ann Young Bair. Albany residents will find three new Albany City Council members when the first meeting of that government branch is held in 2019, with Renee York, Reed Sloan and Gene Ferrill taking seats as first-time council members. That was the way things shook out when Tuesday’s tabulations were finished as far as the final outcome in the races that appeared on the general election ballot that had races with opposition. Clinton County’s new Judge/Executive, republican nominee Ricky Craig, a current magistrate in the 4th district, won that race by defeating democrat nominee Keith Dalton. Craig finished Tuesday’s voting by garnering some 2,775 votes compared to the 1,523 votes Dalton received. Craig replaces current Judge/Executive Richard Armstrong, who will leave office after one term. Craig defeated Armstrong in the May Republican primary election. In another county-wide race that received a tremendous amount of attention from voters, current Clinton County Clerk, Nathan Collins, a republican, earned the win in his race over democrat Dan Thomas by a vote of 2,963 to 835. What caused that race to grab so much attention from the public was the turn of events a few weeks ago when then Clinton County Clerk Shelia Booher suffered a massive stroke and died a few days later. Collins, a nephew to Booher, had been a Deputy Clerk in that office for several years, and was appointed by current Clinton County Judge/Executive Richard Armstrong to fill out Booher’s remaining term. Collins filed his intent to run a write-in campaign seeking to be elected to that office, a campaign effort that included his having to educate the voting public as to how to cast a write-in vote on the electronic voting machines used now in elections. His efforts were successful and when the vote tabulations were finished Tuesday night, Collins and his family, made up of the three sisters of Booher, celebrated quietly in the clerk’s office for a few minutes. In the race for Albany Mayor, current mayor Nicky Smith, who did not run for another term, will hand the gavel over to Pierce who picked up 463 votes to earn that office. Pierce, the current Albany City Police Assistant Chief, won the three candidate race against David Cross, who had 395 votes, Travis Denney with 84 votes and Sara McWhorter with 43 votes. The Albany City Council will see newcomer council members York, Sloan and Ferrill joined by incumbent council members Steven Lawson, Tonda Thrasher and Tony Delk. In those vote totals, Lawson was the leading vote getter with 558, Thrasher finishing second with 484, York third with 432, followed by Delk with 387, Sloan with 362 and Ferrill with 361. Candidates also seeking seats on the council but falling short of the six top vote totals were Leland Hick (318),Frankie Stockton (285), Pam Allred (274), Jon Cowan (233), Carl Craig (220), Raymond Shelton (220) and Clyde Stearns (175). In the only other local race involving opposition on Tuesday’s ballots, incumbent Clinton County School Board member Goldie Stonecipher of the 6th district, lost her seat to challenger Bobby Ann Young Bair by a vote of 411 to 239. Clinton County votes pulled the ballot in three other races that involved decisions, one being a district race for U.S. Representative and the other a constitutional amendment. James Comer, the republican nominee and incumbent U.S. Representative in Washington, was an easy favorite for voters in Clinton County, who cast 3,311 in his favor, compared to 516 votes for democrat challenger Paul Walker. Comer was successful across the 1st congressional as well in winning that race, with 18 of 35 counties reporting Tuesday night, showing Comer with a strong lead of 73,010 to 31,599. Max Wise survived a write-in challenge to retain his Kentucky Senate Seat, favored both in Clinton County as well as across the district. Voters also favored Dan Ballou over Debra Lamber in the non-partisan race for Justice of the Kentucky Supreme Court in the 3rd District. 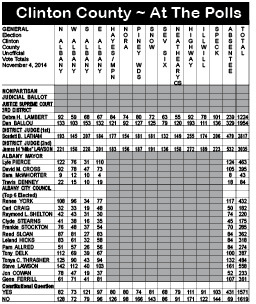 Ballou earned 1,954votes compared to Lambert’s 1,224 votes in Clinton County. 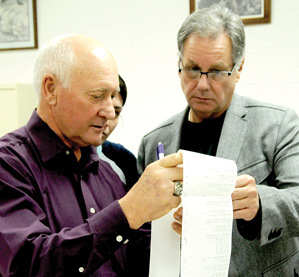 In the only other choice on the ballot, that regarding the constitutional amendment referred to as “Marcy’s Law”, Clinton County voters narrowly voted “no” as their choice, 1,619 to 1,571 “yes” votes. However, statewide, with 82 of Kentucky’s 120 counties reporting Tuesday night, the measure appeared to have a strong chance of becoming law, by more than a two-to-one margin, with 657,614 “yes” votes, compared to 377,540 “no” votes. Several other candidates appeared on Tuesday’s ballot as unopposed candidates who had already won offices by reaching Tuesday’s general election without opponents. 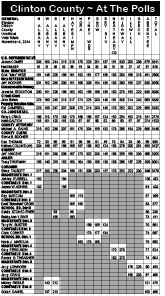 Those candidates, and their precinct by precinct vote totals can be seen in the tabulation table that accompanies this article. Readers are reminded that all vote totals here are considered “unofficial” totals, and will remain so until the election is certified by the Clinton County election commission.